At Stripe A Lot, we measure our success by the volume of customers who come back and request our varied services year after year. Of course, we can also measure it by the amount of new customers we receive based on the recommendations of existing customers. Stripe A Lot is dedicated to holding our position as West Michigan’s leading asphalt service company. This means we will continue providing first-class services for all of our customers – new and old. Staffed by hands-on paving professionals, with our owners—Joe and Nick—personally overseeing every project. Determined that every customer is more than satisfied with their completed project. Dependable, reliable, and experienced in all types of asphalt services. Stripe A Lot is your one-stop shop for all asphalt and pavement needs in West Michigan. When it’s time to choose between local paving companies, Stripe A Lot is the reliable choice for quality work that keeps you on time and on budget. Our experienced crews, premier equipment, and use of quality materials allow us to deliver quality asphalt surfaces on time, every time. We are equipped to handle projects of all sizes and we help you make a great first impression with customers, clients, and guests. No matter your need, we provide paving services for residential and commercial surfaces to make your property look incredible. Whether your parking lot, driveway, or any other asphalt structure needs to be resurfaced, replaced, or installed from the ground up, Stripe A Lot’s decades of experience and expertise are the smart choice for the job. If you’re unsure what approach your paving project requires, Stripe A Lot can help. Beginning with our FREE ESTIMATE, we will discuss your options with you and offer straightforward solutions. Your work will be overseen on-site by one of our owners, and completed by our dedicated and stable crew of experienced asphalt professionals. If you’re looking for an asphalt maintenance company that truly knows what it takes to repair or replace your asphalt surface, you’ve come to the right place. Stripe A Lot has dedicated professionals that arrive fully-equipped with asphalt maintenance solutions — like crack filling — that fit the unique needs of your project. Our expertise allows us to provide the necessary repairs with minimal disturbance to traffic flow on your property. Asphalt is widely used because of its durability and versatility for various projects, but proper maintenance and repairs are key to preserving the life of asphalt surfaces. Sealcoating is the best way to extend the life of your property investment, especially in areas with fluctuating temperatures, as we have here in West Michigan. By using our sealcoating services, you could save yourself thousands of dollars of unwanted expenses in the long run. Give us a call for your FREE ESTIMATE and Joe or Nick will determine what is right for your job. Even better, we don’t ever try to sell you on anything you don’t actually need. Proper water drainage is important for the longevity of your parking lot or driveway. Making sure water is channeled correctly helps to prevent standing water. This is important because standing water eventually seeps through the surface and can cause cracks and potholes. When our professionals install drains, we do it right the first time to save you headache later on. If you had “the other guys” put in the drains in the first place, call us when you need them repaired. As always, we will give you a completely free estimate and determine exactly what your job needs. 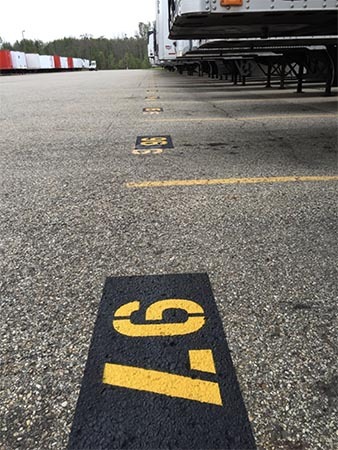 We are committed to making sure your parking lot looks its absolute best. This means having stripes on your lot that really stand out and are easy to see. When customers can easily see the stripes, it makes a good impression – which is exactly what you want. If the stripes in your lot are looking faded, give us a call and we can provide an estimate on what it’ll take to brighten them up. For additional information about any of the services we provide here at Stripe A Lot—or to get your FREE ESTIMATE--simply give us a call at (616) 772-2559. We will be glad to talk, answer any questions you have, and determine what is needed to get your job done the right way!